Fighting Spirit Imbalance: Fact or Fiction? Map making is an important part in Brood War balance. Be it cool map features like mineral walls or lurker egg blocks, or just plain and simple standard maps, they always played a role in how each race played out a map. However, one map stood head and shoulders above the rest in terms of balance, and has been featured in nearly every league and tournament since its debut. It is no doubt this map is Fighting Spirit. Since the map first came out, there was nothing but praise for the map. A map that all three races felt was beneficial to their playstyles. A standard natural, relatively close and easy third, and a wide open center with a few walls. It is no question why this map led the way for future map designs and changed the very definition of standard map making in Brood War. Maps like Jade, Sniper Ridge, La Mancha, and Icarus all share that classic similar safe third. Recently, Fighting Spirit has been eliminated from the map pool in SSL11, after about 5 ½ years leading tournament map pools. However, the community welcomed the change, saying it was a breath of fresh air and that the map had its weak points and flaws. Therefore, we must dive in to the truth behind Fighting Spirit and maps that follow its lead. Hypothesis #1: The map balance is wrong. In the current post-KeSPA era, the map has had very a skewed balance towards Terran with Zerg and Protoss getting the short end of the stick. So why is this? Why was the KeSPA era stat line so evenly balanced while in the current era it's so unbalanced? The map itself did not change during the transition so statistics should remain the same. Some may suggest that with more time, the pros are able to abuse every small advantage they could, and Terran players ultimately came out on top. However, I am very skeptical. This argument suggests that both players and coaches could not solve the map in its reign of over 5 years, which seems extremely doubtful, even laughable. (Icarus not included since only 4 games were played on it). If we look at this much more prominent stat line, you'll notice every map is skewed towards the standard imbalance. So while no map distinctively favors one race, they are all imbalanced towards the same matchups. (Perhaps another article about why there is race imbalance another time). Perhaps we should look at different maps that are much different that Fighting Spirit. Introducing Match Point, Blue Storm, and Neo Electric Circuit. But is Fighting Spirit entirely balanced? In a discussion with kogeT, he mentions a few minor aspects of the map that add up to give Terran a favorable advantage. There are no cliffs for muta micro or lurker abuse. It enables easy map splitting late game which favors Terran. The middle expansion inherently favors tanks and Terran. Main mineral lines are protected by the boundaries of the map (in the corners). Simcity/building placement concept enables a safe natural (maybe a little too safe). Continuing on, the middle expansion almost never comes up in TvZ games, but more commonly comes up in TvT games. Therefore, this is a non-factor. The main mineral lines being protected by the map does hinder mutalisk harass; however, most maps have adopted the corner base layout for years now, so this is also relatively unconvincing. Building placement structures have existed for a while, but it should be noted that the chokes of naturals have gotten noticeably smaller and smaller. This hinders the ability for zergling run-bys and surrounds. However, I still believe these things in total do not put Zerg players at such a disadvantage to warrant the 64% win rate we see on FS. Maybe something closer to 55% would be more reasonable, but the current win rate still stands to be a little more exaggerated. But let’s say they did, and that Fighting Spirit really is a Terran favored map against Zerg for the above reasons. Why did Terran players not dominate during the KeSPA-era then? 51.6% is near even, so there is no evidence that these map imbalances played a role then. Hypothesis #2: Player quality has changed. If we look back to the KeSPA era, each race had their fair share of S and A class players. So in terms of player quality, each race had their fair share of players to hold the torch and pull their own weight. So how about now? Above all, Terran players have dominated. And it's no surprise. The Terran have been making up over 50% of top8s consistently (Kongdoo Starz League only featured 2 Terran in the top8 most likely due to the lack of sSak and Last). In the top 10 Elo ranks alone, Terran players often make up half of the slots with only 1 Protoss in the top (Bisu). In fact, ZerO and especially Killer, may be ranked too high considering their current performances. So given all of this data and evidence, does this really demonstrate that player quality affects map statistics like Fighting Spirit? While I was previously an advocate of this hypothesis, the more research I conducted, the more I realize that this is simply not the case as much as it seems. If Terran power was really the reason for Fighting Spirit's imbalance, then every other map would also show similar statistics, if not completely mirrored. But as we have seen before, the maps have shown relatively stable matchup statistics aside from the natural race imbalance. So what can the reason be? Let’s delve deeper into why Fighting Spirit shows these imbalances. 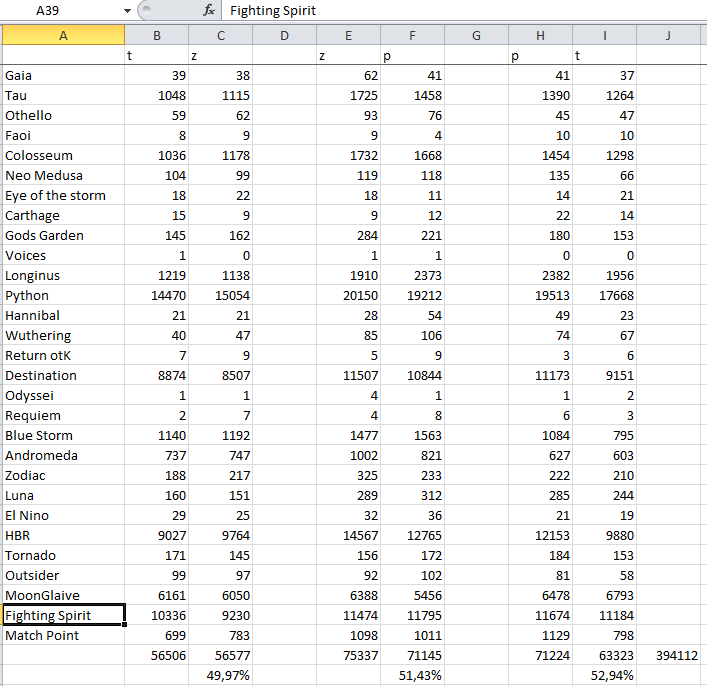 Using the 7 Terran and 5 Zerg I previously listed, I took the data from the TvZ matchups on Fighting Spirit and this is what I came up with. Astonishingly, Terran have an almost 72% win rate, numbers so high that they cannot be fathomable in Starcraft terms. Zerg players on the other hand, have a dismal 44% win rate. However, skeptics of these statistics may say I picked 7 Terran who are notoriously good at TvZ, and 5 Zerg who are notoriously bad at ZvT. But did I? You might be surprised at the data. ZerO, hero, and Kwanro all have about 45% vT win rates, while Killer and EffOrt have above 50%. In total, their combined win rate is 209-245, or a bit above 46%. So they see a -2% drop in win rate on Fighting Spirit, but this isn’t very conducive of firm evidence. But the Terran data was extremely surprising and caught me off guard. The Terran group only has a win rate of 256-214 combines, or 54.5%. Their Fighting Spirit win rate is a +17% increase compared to their average, which means if you remove Fighting Spirit from the map pool, Terran actually only have a 144-170 win rate, or 45.9%, against Zerg. This translates to nearly +26% in win rate between Fighting Spirit and other maps, representing a dramatic 44% difference. This measure, by itself, reveals to us the underlying reason why Fighting Spirit has such an obscene win rate. Terran have simply figured out Zerg on this map, while Zerg players have been unable to cope with it. Ultimately, Fighting Spirit’s current massive Terran favored disparity can be answered through one simple answer, Terran players perform and prepare so much for this map compared to any other map in the current map pool. When there is a 44% difference in win rates for the top Terran players between FS and other maps, it means three possible things. That Terran players just prepare so much better than Zerg players for this specific map. That there are features that inherently favor Terran in the TvZ matchup. However, there is no evidence to this measure, since Terran players go basically even with Zerg on every other similar map as Fighting Spirit, leaving no conclusive data to support this theory. The other maps in the map pool are imbalanced in favor of Zerg, which is why these Terran players have a hard time dealing with them. This claim is also not well supported, since once again, there is little proof of map imbalances with the rest of the map pool. One thing I look forward to in the coming SSL and other tournaments that remove Fighting Spirit, will Terran players still reign supreme over Zerg? Considering their 45.9% win rate on every other map, Terran seem to still be confused with the rest of the map pool. Will they adapt quickly enough, or will Terran finally be brought down to normal levels? All of this will be revealed to us at the conclusion of SSL 11. FS is/was good while it lasted, but it is time for something else, balance or not. Note to all our readers, if anyone has an interesting idea or topic s/he'd like to write about or analyse, do contact TL BW staff. We'd love to help in the presentation, content, or just language editing, to give it the best platform possible. Do let us know and we'd be glad to help make it happen! If we look at this much more prominent stat line, you'll notice every map is skewed towards the standard imbalance. So while no map distinctively favors one race, they are all imbalanced towards the same matchups. There's no especially good reason to think that balance is equal at all levels of skill. Maybe this is what balance looks like a notch under the highly structured environment of progaming teams. StarCraft has always been imbalanced. terran has always been the underpowered one among protoss and Terran. The problem is no one knows how to play Protoss or Zerg which is why there's so much imbalance in Terran's favor. Bisu is the closest one to using Protoss correctly and has a similar playstyle to mine. I personally think that Terran is the 'strongest' race in Broodwar if the player can take advantage of all its cost-effective units. (Think widow mine with vultures, science vessel, marine and medic etc) However, you need to be able to micro well and be able to multi-task well in order to take advantage of the race. When you watch Flash play Terran at the peak of his game, it just seems so impossible to break the terran defense. this was somewhere mid-season, but with close to 400k games, this is the largest sample that i know. I just posted this here to have stats for the lower levels too. It would be interesting to see how the stats change with rank, but we don't have data about that. Or at least i don't have. If any of you have any kind of large match up balance stats, send me please. To even suspect Fighting Spirit to be imbalanced? This is blasphemy, I say! The gods of Starcraft will not forgive this! Thanks for all this! I always had un-researched suspicions as to imbalances in Fighting Spirit, so I'm glad to see this discussed more in-depth. In the realm of pure opinion, I can definitely say that I've grown bored of FS as its era's one map. Nice write-up otherwise, enjoy reading thanks. Damn that's a sweet question. I honestly assumed that after having downloaded 30+ versions of it on Fish that it was the "perfect" BW map. Map gets older, defense gets better, Terran timings get figured out. FS is probably the most exhausted map in history so if Bisu speaks the truth there's no map more likely to feel the Terran-creeps-ahead effect that he describes. What's more, there can be little doubt that the overall mechanical skill level has dropped and the fishlords that get into these broadcasted events are ultimately a tiny group of amateurs with only roughly-equal skill levels, meaning 1) it's more likely for all the good players to randomly be one race and 2) the aforementioned passive, unaffected-by-mechanics advantage that Terran builds on old and overplayed maps is even more significant. More balanced than python and lt? i have no excuse for this. i knew i felt like i was missing out on stuff. but i included horang2 because he has some good proleague moments. i consider him like a kt.violet player. good in proleague, no real results in individual leagues. I want to thank everyone for supporting me in this long journey for this article. It means a lot to me how much people have helped me and talked to me about this beautiful game. Ever since I joined this site, I wanted to become a writer here. And 5 years later, it's finally happened. Thank you. Seriously. Shoutouts to prech, BR, BD, koget, and 2pac for all the help and advice you've all given me. I enjoyed seeing the breakdown and the thoughts, but am not sold on the conclusion you reached at the end. It seems unlikely that terran would prepare dramatically better on FS than zerg would. I can't think of a reason of the top of my head that would explain why terrans prepare better than zergs on FS, and can think of several arguments against that conclusion. I guess to me the gist of the conclusion is that if it's not A or B, then C is the only leftover possibility. To me, there are many more options than just C, and it does not follow that if A and B are false, then C must be true. one of the best articles I've had the pleasure to read on TL. thank you.